Instead of skipping breakfast, give your kids one of these healthy breakfasts to get out the door on rushed mornings – no recipes needed! This post was sponsored by Bob’s Red Mill. I only work with brands and organizations that I believe in and as always all opinions are my own. This page also contains affiliate links. See below for full disclosure statement. Mornings are hectic in my house and based on the conversations I have with other moms I know I’m not alone. No matter how early I set my alarm, it is a constant race to get my girls to the bus stop on time (which is 7:34 am, in case you’re wondering). That’s even with setting out their clothes and having snacks and lunch packed at night before they go to bed. Somehow time just goes by super fast in the morning. It’s no surprise that up to 26 percent of school-age kids skip breakfast. Lack of hunger so early in the day is one reason, but based on my unscientific survey of parents, lack of time and rushing to get out the door is the main culprit. 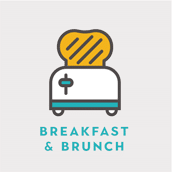 I have previously shared the benefits of breakfast, but it’s worth repeating that children who eat breakfast do better in school and have improved memory, test grades, school attendance, and moods. There are studies to back this up! So how do we solve this dilemma of hectic mornings and the need to get a healthy, balanced breakfast in our kids before they head off to school? Today I’m sharing five healthy breakfasts to get out the door in the morning. You won’t need to fuss with your stove or oven, minimal if any advanced prep is needed, and some of these options your kids can even grab as they’re heading out the door. The best part: there are no recipes to follow. Trust me, these ideas work – they are the top five breakfasts my kids eat on a daily basis! Oatmeal is one of my favorite breakfasts and my girls love it too. I often make a baked oatmeal over the weekend for the school week and sometimes I’ll remember to prep overnight oats at night before I go to sleep, but let’s be honest – there are days when I’m just not that organized. On those days, Bob’s Red Mill Oatmeal Cups come to my rescue. 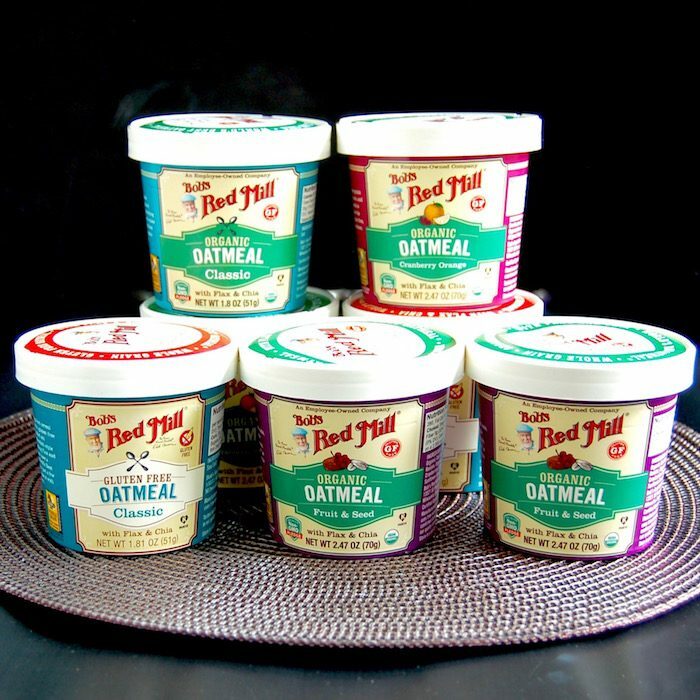 I’m a huge fan of Bob’s Red Mill products and often use their quick cooking oats to make my oatmeal recipes, but these oatmeal cups are especially great on rushed mornings. The classic cups have a combo of whole grain quick cooking rolled oats, old fashioned rolled oats, and stone ground Scottish oatmeal, plus omega-3 rich chia seeds and flaxseeds. Some of the varieties also have dried fruit like dates, cranberries, and oranges, additional seeds, and a touch of sugar for sweetness. They’re all high in fiber and have 7 to 9 grams of protein – a perfect combo for keeping the kids satiated through the morning. Bob’s Oatmeal Cups are easy to make too – just fill them with water or milk (the latter is my preference for a creamier consistency and a calcium and protein boost), microwave for a minute, and let rest for two minutes before you dig in. In the time it takes for the kids to get their shoes and jackets on, breakfast is ready and can easily be taken in the car or on the bus. Kids love waffles, but who has time to be busy with a waffle iron in the morning (for the record, I don’t even own one). Frozen waffles have been around for a long time, but these days there are increased options in the freezer aisle and you can dress them up to make for a more filling and nutritious meal. Here’s the catch: I’m not talking about your typical “l’eggo, my eggo waffle” or chocolate chip variations. The waffles I’m recommending are ones made with fiber-rich whole grains, so make sure you read those labels and look for whole wheat flour or a whole grain mix within the first few ingredients and at least 3 grams of fiber per serving. As for toppings, go beyond syrup to keep this a nutrient-rich breakfast. 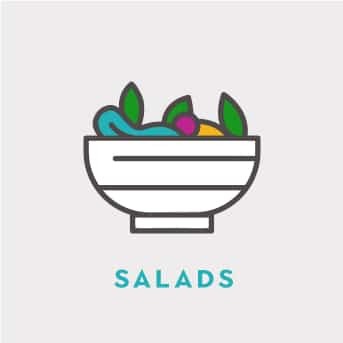 Favorite toppings in our house are peanut butter and fresh fruit usually served as a “happy face.” Other toppings to try: cottage cheese or yogurt with fruit, mashed avocado with everything bagel seasoning, and cream cheese with smoked salmon. 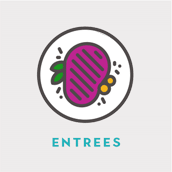 I’m normally not an advocate of drinkable meals, but over the past year or so I have joined the smoothie fan club and have a much greater appreciation for the smoothie’s place in our diets. Smoothies are definitely one of the quickest breakfasts you can make, but depending on what you put in them, they can either be nutrition-packed or a nutrition bust. The key to making a nutrition-packed smoothie is to make sure it includes a combination of protein (e.g. kefir, low-fat yogurt, cottage cheese, silken tofu), fruits and/or vegetables (e.g. bananas, berries, peaches, mango, cauliflower, spinach), and maybe even some healthy fat (e.g. nut butter, raw nuts, chia seeds, hemp seeds, avocado). This combo keep smoothies from becoming sugar bombs that make blood sugar rise and fall quickly, leaving you and the kids hungry shortly after consumption. A note about fruit in smoothies: Fresh and frozen fruit both work well, but frozen fruit is easy to always have on hand and requires no prep. If you’re using fresh fruit, save time by washing and cutting it up the night before. You can even put all your smoothie ingredients in your blender of choice (I like the Nutribullet) in the fridge at night and blend it up in the morning. 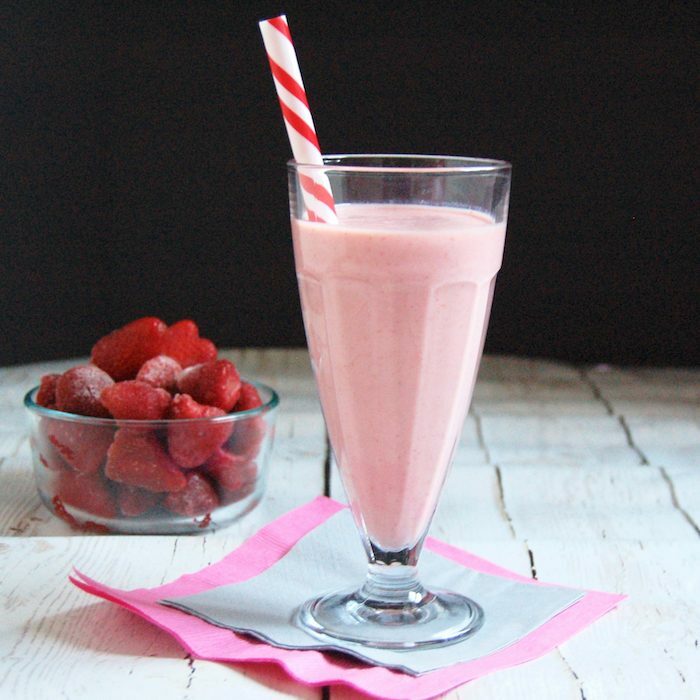 One of our favorites is my Strawberry Kefir Smoothie, but we make different combos all the time – the possibilities are endless. One of my girls loves banana and the other doesn’t, so I often make two different smoothies to please both – the fact that I have time to do that shows you just how quick this breakfast choice is! Like the Bob’s Red Mill Oatmeal Cups, smoothies are a great grab and go option – just make sure you have a cold thermos with a straw or a disposable cup and straw for the kids to take with them. And for those with older kids who may not be full from a smoothie alone, pack a baggie of whole grain cereal to go along with it. 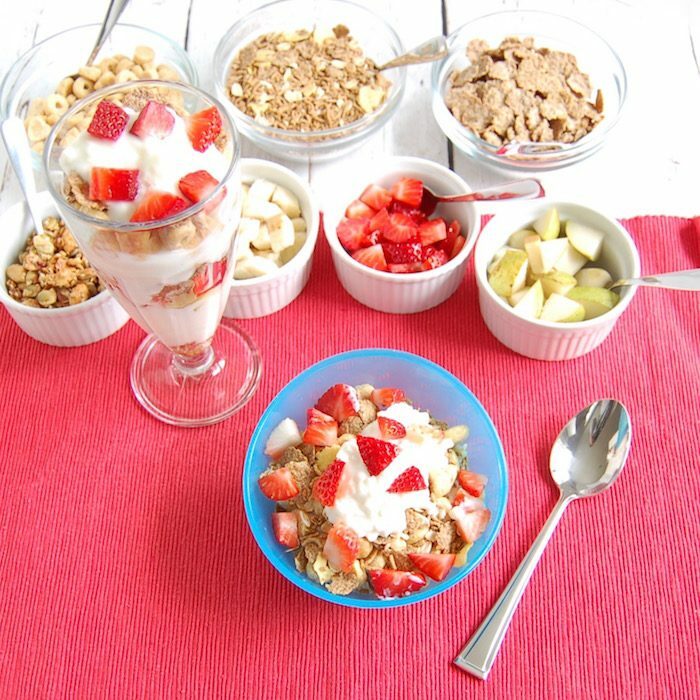 My girls started to love parfaits when one Saturday morning they came down to the kitchen to find the counter filled with bowls of various fruit, cereal and granola, cottage cheese, and yogurt. They had a ball making their own parfaits in ice cream sundae glasses and the whole next week that’s what they wanted for breakfast. Parfaits sound fancy for hectic weekday mornings, don’t they? Not when you keep the fancy title, but pare down what’s actually made. Our weekday parfaits (see blue bowl in picture above) consist of one layer of yogurt or cottage cheese, one layer of fruit, and one layer of cereal (preferably a whole grain option). It still has all the components included in the weekend parfait bar, but it takes a lot less time, making it a perfect healthy breakfast to get out the door. To keep parfait making even quicker, portion out yogurt or cottage cheese the night before and cut up fruit in advance. If your kids are going to make their own, have all the ingredients in bowls covered with saran wrap – those little steps save precious minutes in the morning. I promised you healthy breakfasts to get out the door and I’m not reneging. The muffins I’m talking about are made in advance and stored in the freezer. Yes, this does require some forethought and prep, but if you spend a couple of hours one weekend day every couple of months making a batch or two of muffins, you’ll have your freezer stocked. And assuming your kids eat a variety of these breakfasts and are not having a muffin every day, they will last you at least a few weeks. Now, let me be clear here and say that I’m not talking about dessert-like muffins for breakfast. Muffins that are appropriate for breakfast in our house are those that have some protein, whole grains, and fruit or vegetables. My freezer is always stocked with some combination of egg muffins and oatmeal cups. Sometimes I also have a sweeter variety on hand, such as pumpkin chocolate chip muffins or Rhubarb-Ginger Lemon Muffins, both of which I make with chickpea flour for a protein and fiber boost. All of these muffins can be quickly defrosted in the microwave the morning of, or if you know in advance it’s going to be one of those mornings, defrost them overnight. While these muffins can be satisfying on their own, if your kids are bigger eaters I suggest pairing with a piece of fruit or slathering the sweeter varieties with some nut butter. If you’re still in need of more breakfast ideas for the kids (and yourself), be sure to check out the roundup of quick and healthy breakfast recipes I shared back in September when the school year started. 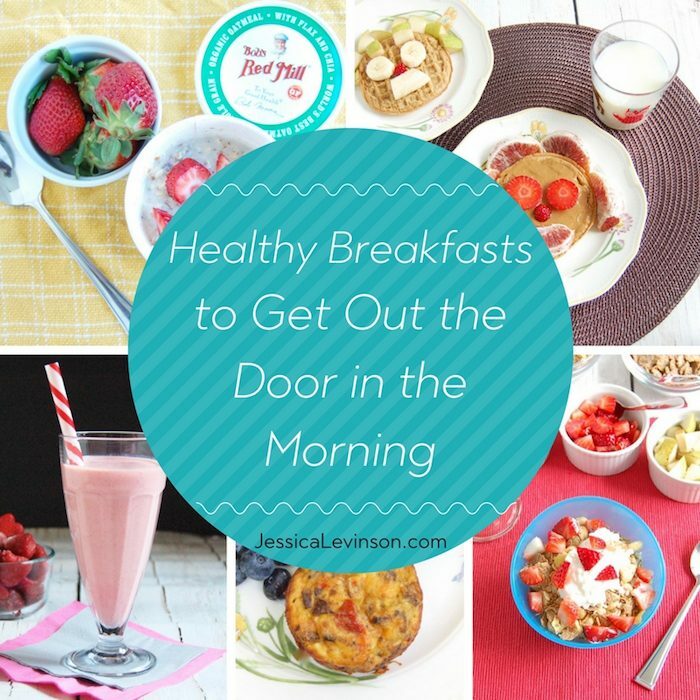 Does your family have any other favorite healthy breakfasts to get out the door? I love Bob’s Red Mill! I’ve had their oatmeal cups and they are delicious – perfect for traveling and hotel breakfasts! Yes Micaela! Perfect for traveling too! Thanks for sharing. I have never seen those Red Mill oatmeal containers!! We don’t have them in Canada.. i don’t believe. 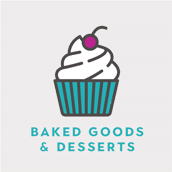 I do love making egg cups and healthy muffins.. will need to try your recipes! Thanks! Thanks Carol. Oh, I wonder if they have the oatmeal cups in Canada. I can find out if you are interested. Let me know if you try any of the other ideas in the meantime. So many tasty breakfast ideas! I loveee breakfast, and I need to try a few of these asap! Thanks Abbey! 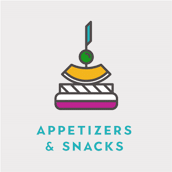 Hope you enjoy them – they’re just as good for adults as they are for kids! Wow! I had no idea 26% of school aged children skipped breakfast! I wonder if sometimes I’m naive to that fact b/c I seriously love breakfast! These are some great options to help everyone fuel their day right! Yeah, it’s upsetting to me, and I honestly never really understood it until now – the mornings are rough! I’m with you though, love my breakfast! I am always a fan of getting out the door quickly! Well, I’m happy to get out the door quickly if I’m not rushed! But the weekday mornings are tough. 7:34!!!! Wozza. Mine have to be out of the door by 7:55 and I though we had it tight!!! Although next year when my eldest is at high school he will be on an early bus……not sure how we are going to adjust! These ideas are great, my kids have eggs and toast most mornings (Scrambled, fried or dippy) as I find if they just grab cereal, come 4pm when they get home, instead of my boys two little monsters arrive home!!!! I love these ideas! Surely pinning for next year! Yeah, it’s so early, and honestly I know people whose kids have even earlier pick up. So hard on the little kids. When I was in high school I got picked up at 6:30 am and I rarely ate breakfast! Hope these ideas come in handy for you next year (and hope your eldest’s pick up isn’t as early as mine was!). I wish we had time for eggs in the morning. I should have mentioned hard boiled eggs in my list, but lately my girls aren’t so into them. They go in phases with that. 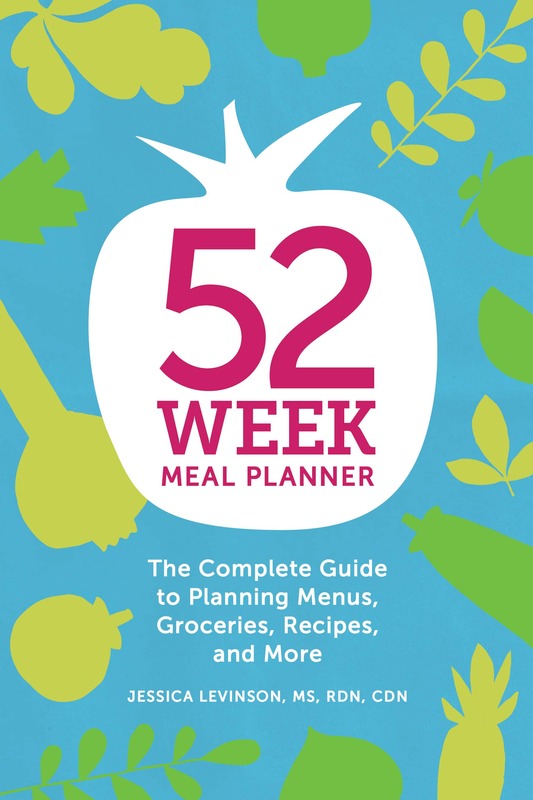 Some great recipes here – thanks! Getting out the door on time and making a healthy breakfast can often be a bit tricky. 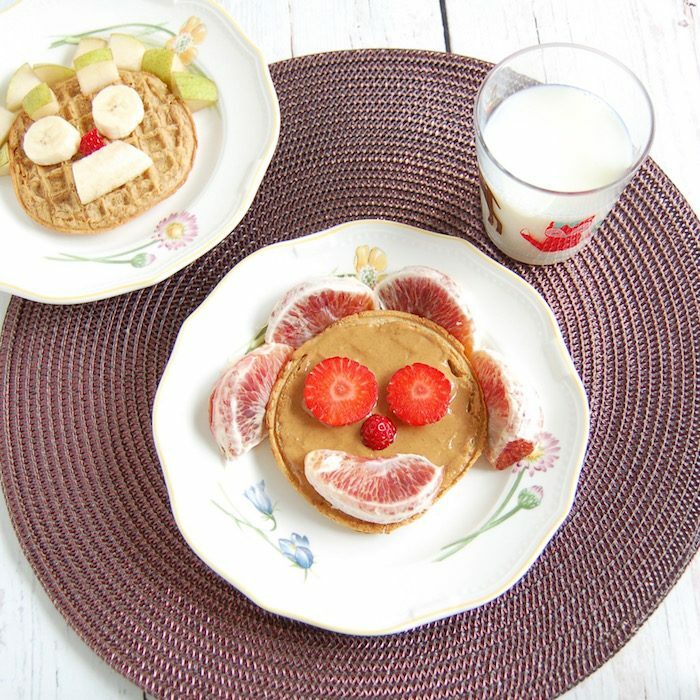 I love those happy face waffles, so cute – my little boy would love these! Thanks Hope. It’s definitely tricky, but a little advance planning can go a long way to making sure the kiddos get a healthy breakfast! Hope your little guy likes the happy face waffles as much as my girls do! Love these ideas!!! People need to realize breakfast doesn’t have to be elaborate!!! And it also doesn’t have to be a muffin from Starbucks! Thanks GiGi. I totally agree! I love all of these ideas! Oatmeal is one of my favorite breakfasts, but I rarely make it from scratch. Can’t wait to try these cups! Thanks Steph. I hope you give these Oatmeal Cups a chance – they will certainly come in handy if you’re not one for making your own! I love love love oatmeal and we are always in a hurry to get out the door. What great options to still have a healthy breakfast! I’m so glad these are helpful options for you Carlee. Hope your family enjoys them! These are such great breakfast tips especially for getting little ones fed quickly in the mornings. Really wonderful post – thank you! Thanks so much Daniela. So glad you enjoyed the post and hope the ideas come in handy! So many great options! Having breakfast ready always makes our mornings go smoothly. Thanks Allison, and so glad you agree! LOVE all of these breakfast options! Lately, I have been devouring lots of smoothies jam-packed with protein, blueberries, and nut butter. They keep me fueled for those busy mornings! Thanks Katie. Sounds like your smoothies are perfectly balanced! Glad they’re helping get you through the mornings. Great tips! I love the oatmeal cups for traveling (have some ready for next week) but when doing them at home we usually do out own in jars or soaked muesli in jars. Overnight oats are a favorite but my oldest isn’t a huge oatmeal fan. Smoothies and parfaits are always a great idea. Parfaits use to be a go-to with my oldest but we haven’t found a dairy free yogurt she loves. The ones she did like were too sweet, not filling, and she got burnt out. Lately it’s been a lot of toast and fruit. My oldest is the one that’s the hardest right now and she’s SO hungry in the morning. I think due to late night soccer training (5 days a week) and she has a snack but she can’t do a big snack and then sleep well so wakes hungry so I’ve been letting her have peanut butter sandwiches on homemade sourdough (it’s been hard to keep up with) for breakfast and probiotics or plant-based milk they keep her full until her 1pm lunch. When we get back I’m going to try some muffins again, thank you! Thanks so much for sharing these great ideas Sarah. It definitely can be more challenging when there are allergies and intolerances in the mix. Sounds like you have a good handle on what works for your girls. I am sure that PB on sourdough is amazing, btw! ohhh these all look so delicious! I just got their whole grain pancake mix and it’s delicious! Thanks Rebecca. 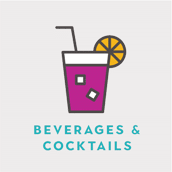 That sounds fabulous – will have to look for it! I love Bob Red Mill oatmeal cups! They are so tasty! I love all their products! Bob’s really does have great products. So delicious <1>and healthy! So glad you like them! These are all such yummy options! 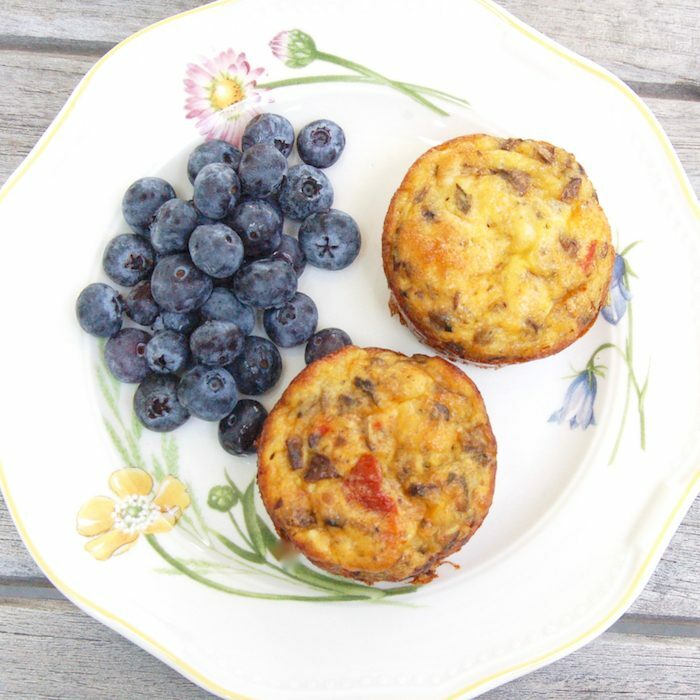 I have some to-go oatmeal cups and make omelet muffins often! Thanks so much Annmarie. So glad some of these ideas work for you as well! My quick breakfast go-to is a smoothie. I can pack so much nutrition into one beverage. I prefer real food, but in a pinch it works! Yes, smoothies are a great quick option. As I mentioned in my post, I’ve never been one for drinking my meals, but they serve a purpose and can really be nutrition packed if made right. Breakfast is my favorite meal! Love all these super simple options, especially for crazy mornings! Thanks Emily. I have a special spot in my heart for breakfast food too! Smoothies are usually my “have to eat breakfast in the car” go -tos. My daughter is still the age were she gets up by 6:15 am but doesn’t have to be out the door until 2 hours later. I’m sure those rushed breakfasts will happen way more often when she’s off to middle school in a few years! Wow, Deanna, I am amazed your daughter doesn’t have to leave for school until after 8 am! Lucky girl! I’ve always been grateful my girls are good sleepers and don’t wake up so early, but it definitely makes school-day mornings challenging. Thanks Angela. Glad to hear that! Those oatmeal cups look like a great option for when I’m busy in the mornings! And the parfaits are such a fun idea, especially for the kiddos! They really are Brittany! Hope you and the kids like them, and also give the other ideas a try! Such great ideas! 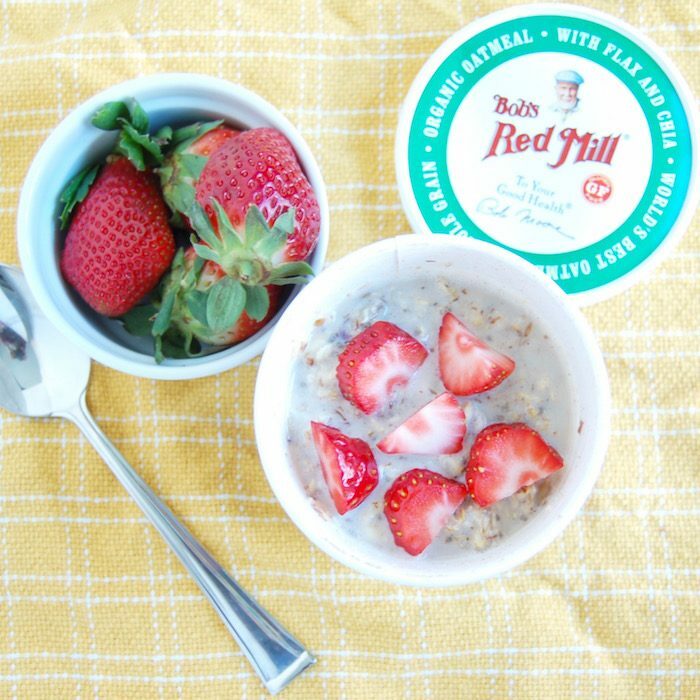 I love the Bob’s Red Mill oatmeal cups for a quick breakfast or snack. 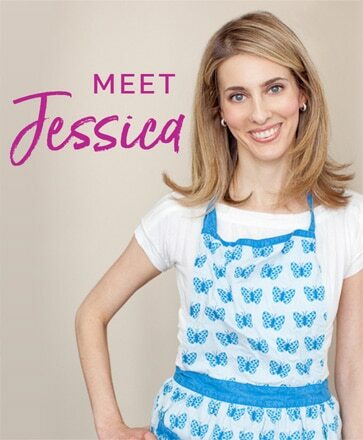 So many great ideas here Jessica! I just discovered the Bob’s Red Mill Oatmeal Cups at Costco the other day~perfect for both my teenagers who are in a hurry to get out the door (by 7:10 at the latest) every morning. 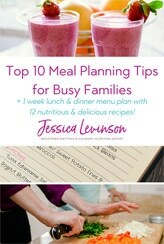 Great reminder to make some egg muffins too-those are always a hit! Thanks EA! And wow, 7:10! I remember the days of pre-sunrise waking in high school. These oatmeal cups are definitely perfect for your kids. Oatmeal ANYTHING is a win in my books! I’m the same way! Hope you enjoy these. Thanks Abbie! Hope they are helpful for your family too! Smoothies and parfaits are my favorites. Homemade muffins are also great if we want something healthy in the morning. So glad you enjoy these options too. Thanks for sharing Stephanie! I have suggested this post to many of my students because they need a sharp mind that only lives in a healthy body. A very nice post, thanks for sharing. Also, I am subscribing to all your future articles. So glad to hear that Jack. Thanks for subscribing and please let me know if there is anything in particular you would like me to write about that would be helpful.